It's been a month since the fatal sinking of the Costa Concordia off the coast of Italy. And, now that the half million gallons of on-board fuel are being safely siphoned off, the ship's owner must decide—raise it from the seabed with hundreds of thousands of ping-pong balls or call in the Jawas and have it dismantled for scrap. The first problem—the Costa Concordia is ginormous, literally double the size of the Titanic and weighing in excess of 112,000 gross tons. The second problem—the Costa Concordia is resting precariously on a subsurface shelf and could potentially "drop another 200 feet [60 meters] or more," says Mike Lacey, secretary general of the International Salvage Union if it were dislodged from its perch. This position is so tenuous that Smit, the Dutch firm responsible for extracting the fuel reserves, had to pump seawater back into the tanks to avoid shifting the boat's weight. 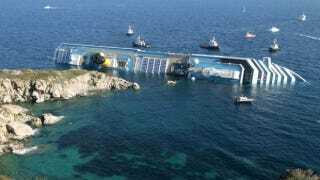 The owners of the Costa Concordia have already requested bids from ten firms to perform the clean up effort. The two most reasonable plans involve either cutting up the ship or refloating it—neither of which is simple. Cutting up the ship is straightforward but has to contend with three-inch steel plates and employ huge 10-meter-diameter magnets to pick up stray debris on the sea floor. The fact that the ship cost $600 million to build and has only been in operation since 2006 also make simply dismantling it a very bitter pill to swallow. An exotic solution would involve pumping air-filled polystyrene balls into the Costa Concordia to make it float to the surface, an idea tried in the past in Iceland and Kuwait. (A similar concept, using ping-pong balls, was actually first mentioned in a 1949 Donald Duck comic, and science fiction legend Arthur C. Clarke invoked a similar idea in The Ghost from the Grand Banks, suggesting billions of glass bubbles could raise the Titanic.) [International Salvage Union secretary general Mike Lacey] doesn't think much of this idea, either. "I haven't heard of them being used in years and years-they make a hell of a mess, since you can't control them, and they get all over the sea and every damn place," he says. "They're a real problem to clean up, so I don't think the authorities would take too kindly to their use here." The ship would first require extensive and expensive repairs to seal the gashes in the hull and prevent the balls from leaking out. Lacey isn't impressed with this idea, though. "Everyone keeps talking about the damn inflatable bags, but there aren't any big enough to do the job. They might contribute, but they won't be enough to do the job on their own." he said.